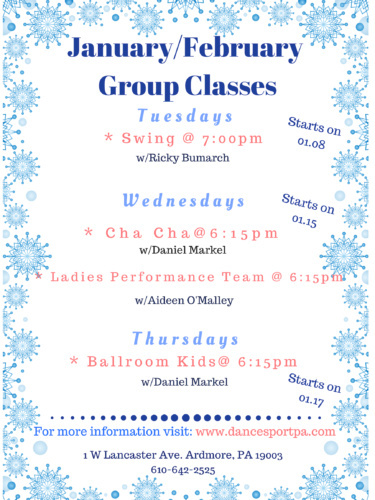 New Year – New Dance classes means that we have a wonderful program prepared for an experienced or a beginner dancer. We also put together classes for Teenagers as we believe in young, motivated, and eager to learn students who are the future of a Ballroom World. We all know about the positive aspects of dancing: boosting energy, increasing the production of hormones of happiness, bringing joy, strengthening memory. Dancing is not only a fun way of getting fit and tones but it also give a chance to meet new people and develop friendships that would last forever. We love to dance and we hope that you will join our wonderful World of Ballroom dance and open yourself up for a new exciting experience!